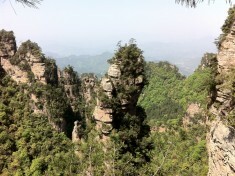 A wide range UNESO listed national park located in central China with incredible rocks all around. This park is famous since the movie Avatar was recorded here, although this is claimed by more national parks in China, this park is definitely worth a visit. A concentration of quartzite-sandstone formations can be found in Zhangjiajie National Park, like it’s found nowhere else in the world. 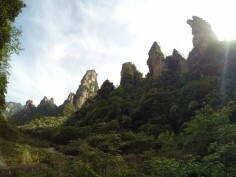 244 Peaks and 3000 karst pinnacles and spires rise up in this mysterious landscape. The movie of Avatar was recorded here. 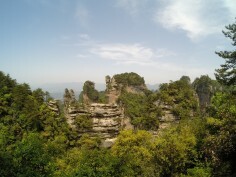 By plane: fly to Zhangjiajie Hehua Airport, which is located 6km southwest of Zhangjiajie city and 50km from Zhangjiajie village and National Park Entrance. 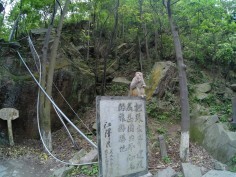 A taxi from the airport to the park entrance is about 110 RMB. 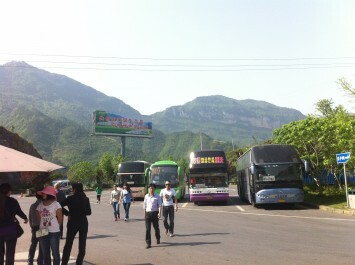 By bus: there is a long-distance bus station in Zhangjiajie City, which connects to Changsha (4 hours, 40 RMB), Shanghai (20 hours, 310 RMB), Xian (20 hours, 290 RMB), Fenghuang, Jishou and Wuhan. By train: 8km from Zhangjiajie city there is a trainstation which connects to Changsha (6 hours), Beijing (25 hours), Guangzhou (14-21 hours), Huaihua, Jishou and Yichang. 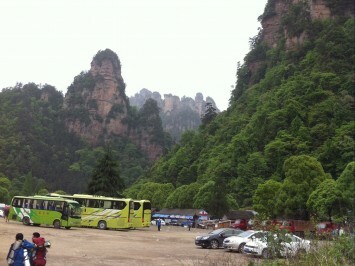 From the long-distance busstation (in Zhangjiajie City), to the park entrance (in Zhangjiajie Village) busses run the whole day between 6am and 7pm. If you have a park entrance ticket, this busride is for free. Taxi from the city to the village is about 120 RMB. 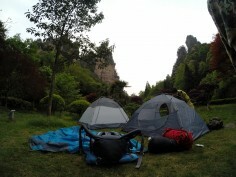 How many days in Zhangjiajie? 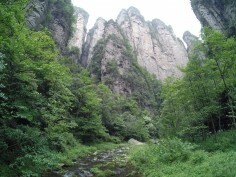 A ticket to Zhangjiajie national park is valid for three days. Although you can spend more days, three days are clearly enough to get a good impression of the park. The ticket offers you entrance to Zhangjiajie, Tianzi Shan, Yuanjiajie, Suoxi Valley scenic areas, which covers about 264 square kilometers. Ticket price: 245 RMB (± € 36) for three days, students can get about 50% discount. Cable car tickets are not always included in the entrance price. Most busses are included. 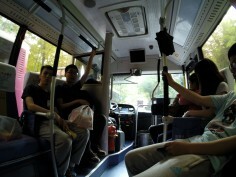 Arrive in the night in Zhangjiajie village by bus. Take a tent with you, and spend the night at the streets in the village. Get up early in the morning to grab a breakfast and food for your days in the park. 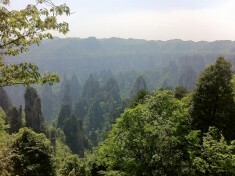 You can either search for a cheap place in Zhangjiajie city and get up early to reach for the park. If you are a student, buy your ticket with discount. Enjoy the park in the daytime and stay during the nights in the park, this is allowed. You can stay in a hostel in the park, which is not expensive (dorms are around 40 RMB per night), this saves you the bus tickets from/to the park. A cheap but good hostel is Zhongtian International Youth hostel. You can either set up your tent within the park, we set them up near a restaurant during the night. Ofcourse keep the park clean, don’t be too noisy and remove your tent in the early morning. It is probably not wise to put your tent somewhere in the wild since there are a lot of animals in the park. The best way is to ask permission although this can be difficult in Chinese language. Food can be bought at many places in the park. 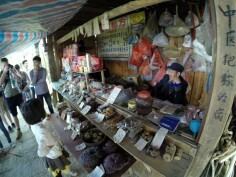 Keep in mind that the food up the mountain is more expensive than the food down there in Zhangjiajie village. 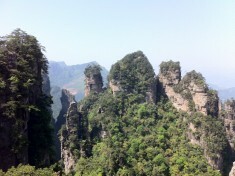 We would like to give you some advice for your next destination, good to combine with ZhangJiaJie.